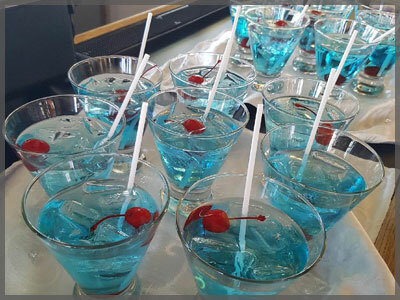 Cash bar – patrons purchase their own drinks. We accept cash, Visa, MasterCard, American Express and debit. Guests may run tabs with a credit card. 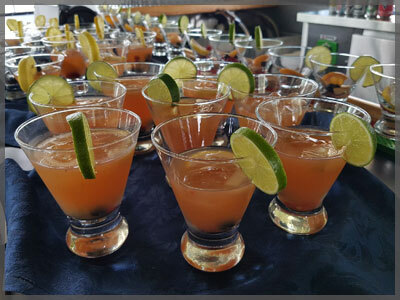 Consumption Bar – a bar deposit of $35.00 per person must be paid prior to the cruise. Final charges will be based on actual consumption. Monies will either be owing or reimbursed post cruise. Pre-purchased Drink tickets – $7.25 per ticket for house brands (beer, wine, liquor); $7.75 per ticket for house brands plus house premiums (beer, wine, liquor). Tickets not used will be refunded by the office, a couple of days after the cruise. All applicable taxes and gratuities apply. Combination Bar – e.g. charterer purchases wine for dinner, but other beverages are offered in a cash bar format. Specific brands may be ordered on request. Special requests – You may request brands/specialty drinks that we do not regularly stock. Orders must be made a minimum of one week prior to your event. A $100 stocking fee applies; charterer is responsible for purchasing the entire bottle. Patrons may not provide their own beverages. All beverages are subject to 13% HST. Prices subject to change without notice. Pre-purchased beverages/tickets/consumption/host bars are subject to a 18% service charge. HST applies.